TransportiCA: Governing Magazine: Streetcars: If You Build It, Will They Come? Governing Magazine: Streetcars: If You Build It, Will They Come? Slow to build and expensive to operate, streetcars could be the most maligned mode of transportation in America. Still, cities keep building them. 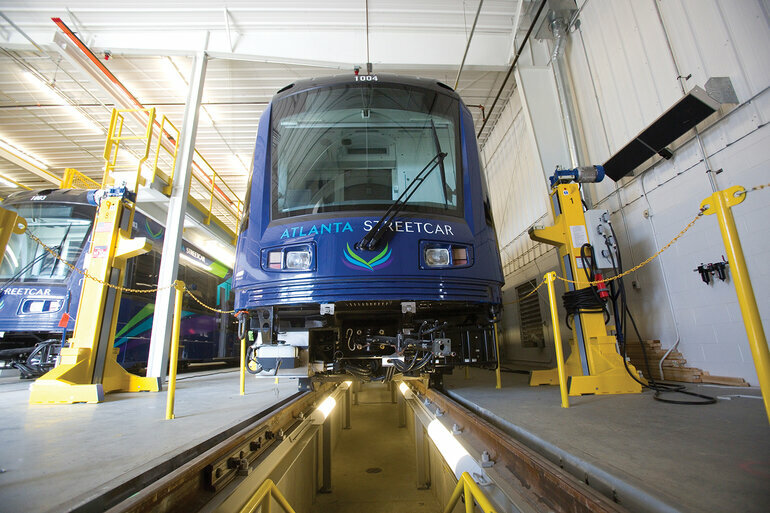 The long-awaited Atlanta Streetcar got off to a rough start. The 2.7-mile system began running in the final days of 2014, more than a year and a half after it was originally projected to open. In the time it took to build, construction costs jumped from $70 million to $98 million. Even after its vehicles started making the downtown journey between Centennial Olympic Park and Martin Luther King Jr.’s Ebenezer Baptist Church, problems persisted. Service stopped for several days last summer so crews could fix the overhead line that powers the electric vehicles. Staff shortages frequently reduced the number of cars on the track. Federal regulators dinged the city and its transit system for safety violations. And after an initial free-fares period, ridership dropped dramatically in the first few months the system began charging passengers. The streetcar’s champions, most notably Mayor Kasim Reed, acknowledge there have been “growing pains.” Getting the streetcar up and running was certainly a novel experience. The 79-foot-long dark blue cars, which can hold as many as 200 passengers, are the first streetcars to travel the city’s roads since 1949. Atlanta has a lot of company. Cities across the nation are building streetcars these days to spur economic development, address social ills and, of course, provide more transportation options. But like Atlanta, many of these cities have faced enormous problems reinventing a mode of transportation that all but disappeared from American cities six decades ago. That tension has sparked heated arguments just about anywhere streetcars have been introduced, planned or even just discussed. More often than not, that disagreement comes down to whether streetcars should be evaluated solely on their ability to move people around, or whether they should also be judged on the more amorphous economic, civic and societal benefits they appear to convey. There’s plenty of fodder for the debate. Atlanta certainly wasn’t the first place to bring streetcars back to its neighborhoods. Cities like Little Rock, Ark. ; Portland, Ore.; San Francisco; and Tampa, Fla., opened new systems a decade or more ago, while New Orleans and Philadelphia never shut down their pre-freeway-era systems. But the concept has really taken off in recent years, as walkable neighborhoods have become more desirable and federal funding has helped cities foot the construction bill. Charlotte, N.C.; Salt Lake City; Seattle; and Tucson, Ariz., are among the cities that have recently added streetcars, while Milwaukee, Oklahoma City, Tempe, Ariz., and potentially even New York are planning for future systems. This year, though, could be a banner one for streetcar openings. A total of eight streetcar projects have or are about to come online, including five in cities with no previous service -- Cincinnati, Detroit, Kansas City, Mo., St. Louis and Washington, D.C., according to Yonah Freemark, author of the blog The Transport Politic, which tracks new transit openings. Operating in many different environments, streetcars vary widely in their look and feel, not to mention the nitty-gritty details of their operations. They range from antique cars prized for their historic charm, like those in New Orleans, to sleek modern cars like Atlanta’s that closely resemble light rail vehicles. What generally distinguishes streetcars from light rail is that streetcars are smaller, travel in traffic, have shorter routes and make more frequent stops. 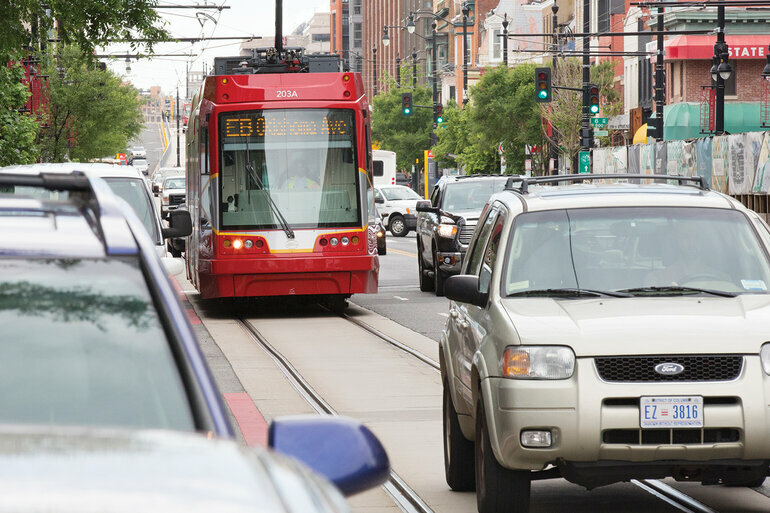 Light rail is built to move people between neighborhoods, while streetcars typically help people get around within neighborhoods. Although the distinctions may seem small, they help explain why streetcars seem to get a lot more criticism than light rail projects, even though both have proliferated rapidly in recent years. Hands down, the most emulated streetcar system in the country is Portland’s. A pilgrimage to Portland is virtually a prerequisite for any city leader serious about building a streetcar system at home. Cincinnati’s delegation has visited Portland 39 times because it’s an example of how a streetcar can both improve transportation and create a vibrant neighborhood out of an overlooked industrial area. For Bauer, the success of the streetcar goes beyond transportation metrics. “The takeaway is that if you focus on the streetcar as a mode of transportation, you forget about all of the partnerships that came along with it,” he says. Bauer credits the revival of the Pearl District and the flurry of development along the streetcar lines to those partnerships. People in Portland used the streetcar as an “organizing principle” for how they wanted their neighborhoods to develop. It meant that the city wanted to promote compact growth, which affected its land use plans, zoning and park improvements. Of course, the zoning changes, incentives and other city activity also contribute to the economic revival that is often attributed to the streetcar. The comprehensive strategy might be good for the city’s economy, but it makes it hard for anyone to quantify what, if any, economic impact the streetcar has made on its own. Jeff Brown, a Florida State University professor and self-described “streetcar critic,” chafes at the idea that streetcars should be judged by their non-transportation effects. “It bothers me a lot,” he says of Bauer’s argument. “They are transportation, and it is transportation money that pays for them. The only way a transportation investment will have any kind of affect on everything else is if people use it.” Brown finds the arguments about the intangible benefits on economic development are almost identical to the ones used by civic boosters to build convention centers and aquariums. “It’s just the latest variance of that downtown revitalization agenda,” he says. Most of the added costs from streetcars, compared with buses, come upfront with construction. Building tracks in downtown districts -- digging up streets, adding power lines and moving other utilities -- can be expensive. The picture is more mixed when it comes to operating expenses. Nationally, streetcars cost $1.50 to run for every mile a passenger travels, compared with $1.05 for standard buses and 70 cents for light rail, according to 2014 data from the Federal Transit Administration. On the other hand, streetcars generally collect a higher percentage of their operating costs (36 percent) than either buses (26 percent) or light rail (28 percent). Still, if every streetcar system produced the same ridership, reliability and economic development that Portland’s did, it’s a safe bet that there would be far fewer streetcar critics. But it’s the experience of several beleaguered systems that frighten the public and make streetcars a tough sell. One of Leif Dormsjo’s first decisions when he became director of the Washington, D.C., Department of Transportation in 2015 was whether to kill off the district’s long-stalled streetcar. Efforts to get the streetcar up and running along H Street, north of Capitol Hill, spanned multiple mayoral administrations. 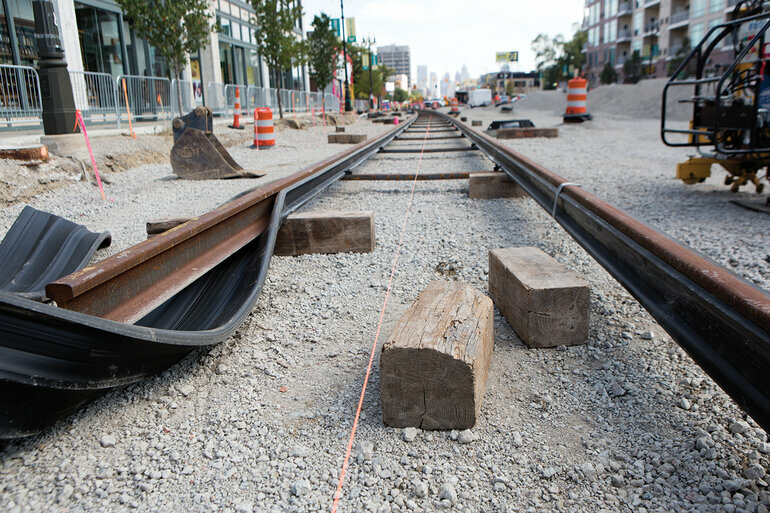 By the time the line opened this winter, the tracks on the street had been laid for six years with no service to the public. The district had run into problems with the construction of a maintenance facility. Behind the scenes, the agency also had trouble with document management and scheduling. As a non-transit agency, it had little expertise on staff and had to rely on outside vendors. When testing finally started, streetcars ran into parked cars along the narrow street, and one even caught fire. Dormsjo called in transit experts from around the country to provide a frank assessment about whether the project could go forward and, if so, how. For Dormsjo, the question was more nuts-and-bolts than whether the H Street line was a good idea. “It was more of an operational question: Is this thing built in such a defective way that we can’t really fix it?” he says. “That was the test.” The experts told him there was nothing fatally flawed about the system, but it would need a lot of work. A year later, the H Street streetcar finally carried its first passengers. During the delays, though, the H Street corridor began to flourish. The commercial strip had suffered since it was burned in the 1968 riots following the assassination of Martin Luther King Jr., but now trendy restaurants and bars replaced abandoned storefronts. A grocery store moved in, and nearby housing prices shot up. For the most part, the renaissance happened after the district announced it would build the streetcar, but before the trolley ever left the barn. A busy bus line had been serving the same area well before the boom and, in fact, continues to provide more frequent service than the streetcar on the same route today. So how necessary was the streetcar to sparking the revitalization? Was development following the streetcar, or was the streetcar following the development? Dormsjo believes the streetcar was key to the H Street boom. Yes, he says, the district overall has seen an economic resurgence at the same time. But then he ticks off the neighborhoods that benefited the most. The thing that all of them have in common, he says, is that they have easy access to fixed-rail transit. For the vast majority of them, that means a Metro subway stop. For H Street, it was the streetcar. “Any developer who’s got a decent track record and access to capital is going to tell you that the first box they check for a new project is: What is the nearest transportation?” he says. If anything, Dormsjo believes that one of the biggest problems with the district’s streetcar is that there is not enough of it. It basically stays in a single neighborhood, and it only comes near one Metro station, where transfers are a hassle. His agency is working on plans to extend the line in both directions: across the city to Georgetown in the west, and across the Anacostia River to a subway stop in the east. If the biggest problem with Washington’s streetcar is that it was built too little and too late, the biggest problem with Tampa’s might be that it was built too early. The Florida city’s 2.7-mile system, which opened in 2002, connects Tampa’s historic Ybor City neighborhood with the port, allowing cruise ship visitors to access the convention center and downtown. In keeping with the historic character of Ybor City, Tampa uses refurbished streetcars. They have modern amenities like air conditioning, but almost all of the mechanical parts are 80 to 90 years old. They’re far less reliable than modern streetcars, typically being pulled out of service once every seven days as opposed to once every two months for newer vehicles. That’s a big reason why few of the newer streetcar systems use refurbished vehicles. In fact, Charlotte recently opted to ditch its nostalgic streetcars when it extended its line. Tampa’s early debut has meant that it started at a time when streetcar systems were still viewed as tourist draws. Tampa’s system wasn’t designed to connect with other transit lines. The early start has also meant that the service faced severe budget crunches during the Great Recession, which devastated Florida. Budget cuts forced the city to scale back the streetcar’s opening hours. Tampa has the ignominy of being a transportation system that doesn’t run during the morning commute. Most days, it opens at noon. Bauman hopes one day the Tampa streetcar can increase its hours to include the morning commute. He wants to extend the line to a transit hub used by local and national buses. It’s a difficult vision, especially after the county board blocked a ballot measure this spring that could have increased funding for the streetcar. 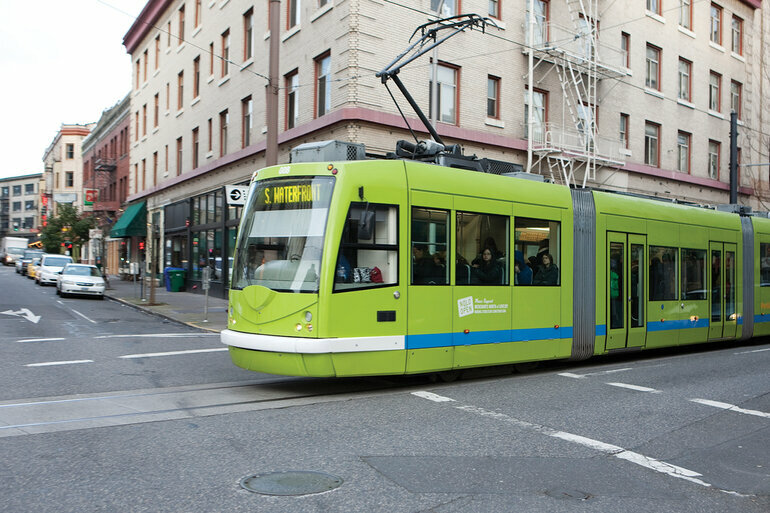 Portland, Ore.’s streetcar system is widely considered the best in the country. The area along D.C.’s streetcar line began to flourish well before service began. 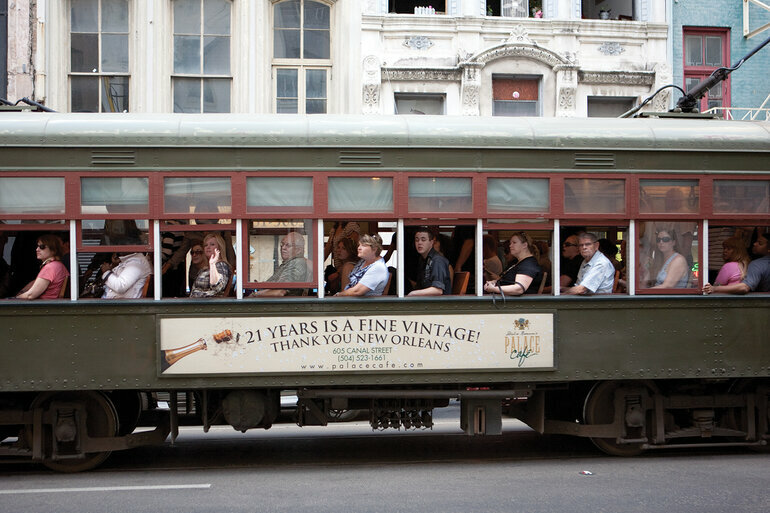 New Orleans’ iconic system not only moves residents around the city but is also a draw for tourists. After a bumpy start, Atlanta plans to expand their 2.7-mile system. 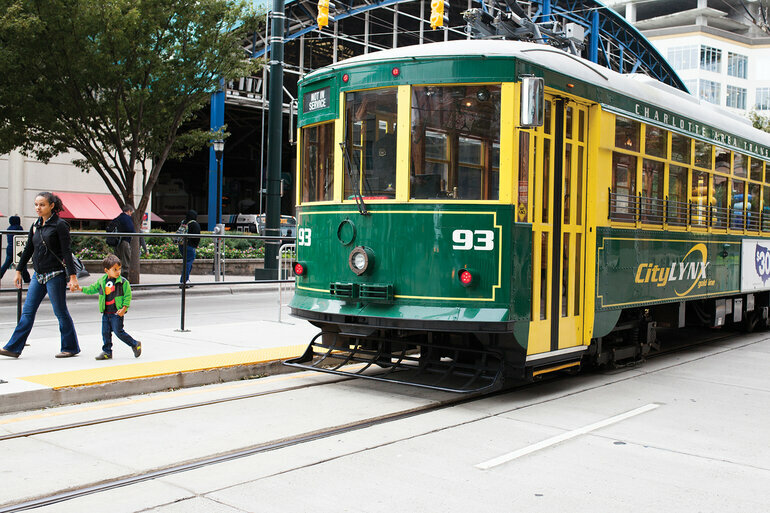 Charlotte, N.C., plans to replace its replica streetcars with a modern fleet when the next phase opens in 2020.